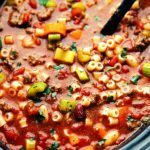 A delicious and hearty slow cooker pasta, vegetable, and ground beef soup copycatting the famous “Olive Garden” Pasta E Fagioli. To get this soup recipe just right, I tried to convince the husband that he needed to take me to Olive Garden on a weekly basis (I started by saying bi-weekly but I could just feel his eyes begin to roll) until I got it *just* right. If he had agreed, I also had a secret agenda not to perfect a recipe for the next four months. That would have been a lot of Olive Garden trips! ?? However, he didn’t buy it. He knows me and my secret agendas too well by now. BUT he has taken me on a few dates to Olive Garden, and this is the soup I order each time! So I did have a pretty good idea exactly how I wanted it to taste and this soup is pretty close to the exact pasta e Fagioli you’d get at Olive Garden! 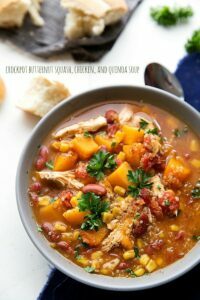 This isn’t just a soup recipe where the crockpot makes things super simple; it’s one where the slow cooker makes everything more tasty! 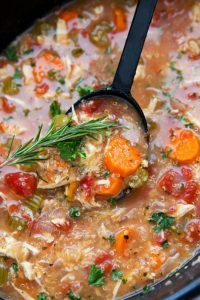 By slow cooking the ingredients all day along with a hearty tomato-based sauce like Prego Chunky Garden, the ingredients have a wonderful chance to meld and heighten. 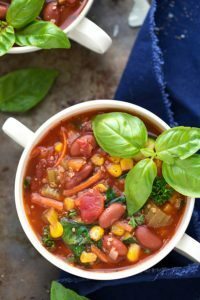 For the spaghetti sauce, I used Prego Chunky Garden, which gives this soup such a great flavor and adds more texture, but the Traditional Sauce works as well! So if you already have Prego in your cupboard, you don’t have to run out and switch. Both sauces work, and I love the super rich tomato flavors in this soup! Now, you can bring Olive Garden soup home tonight with this recipe! In a medium-sized skillet over medium heat brown the ground beef and drain out the grease. Transfer to the slow cooker. To the slow cooker, add in the carrots, celery, garlic, diced tomatoes, red kidney beans, white cannellini beans, spaghetti sauce, tomato paste, salt, pepper, oregano, basil, thyme, and bay leaf. Stir. Cover and cook on high for 3-5 hours or low for 5-7 hours or until the vegetables are tender. About 20 minutes before serving, boil the pasta until al dente. Reserve the water and drain. Either add the pasta to the soup or serve on the side. 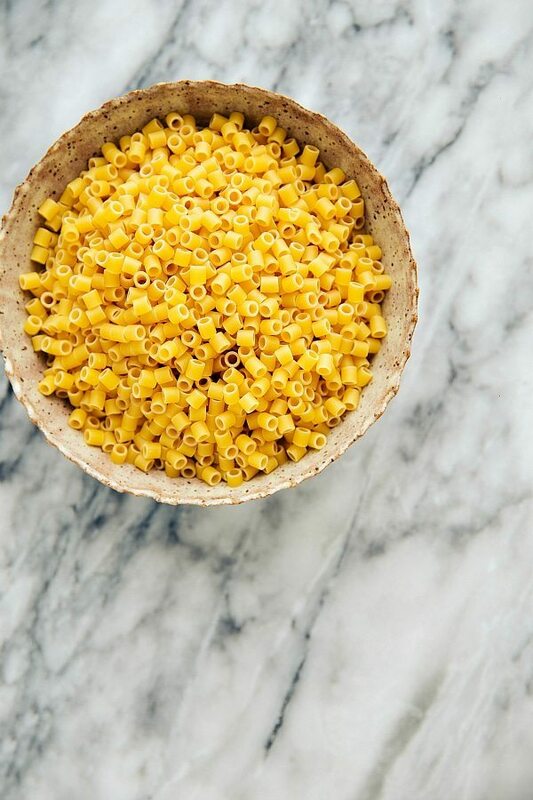 I like to serve the pasta on the side so you can add what you want and then store (or freeze) the remainder of the soup without the pasta getting "soggy." 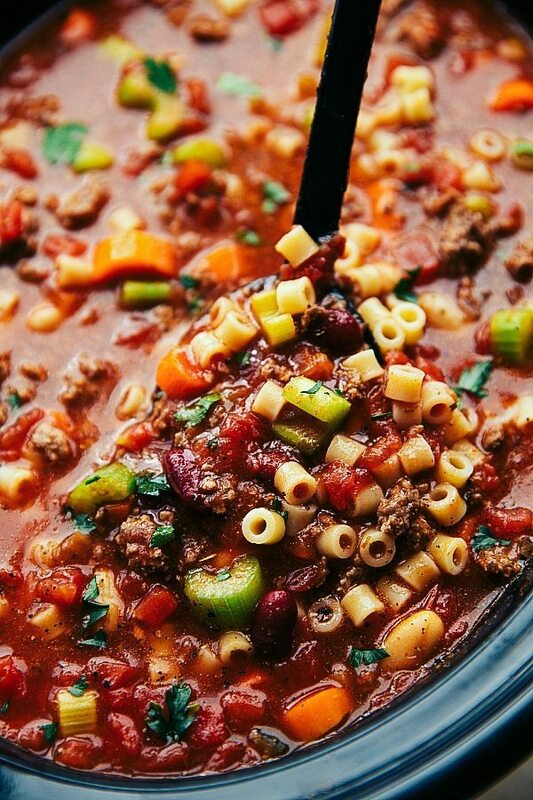 ALTERNATIVELY, (if you plan on eating this soup all in one day), you can add the uncooked pasta to the soup about 30 minutes before serving (turn heat to high). Garnish with freshly grated Parmesan cheese and fresh parsley if desired. This soup is extremely thick and hearty -- more of a stew-like consistency. We LOVE it this way, but if you prefer a "brothier" soup, add in some beef broth. OR add in some of the reserved pasta water and a cube or two of beef bouillon. 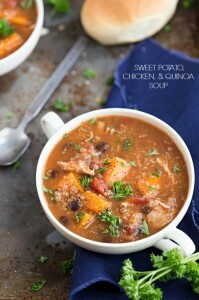 This soup looks so so delicious! 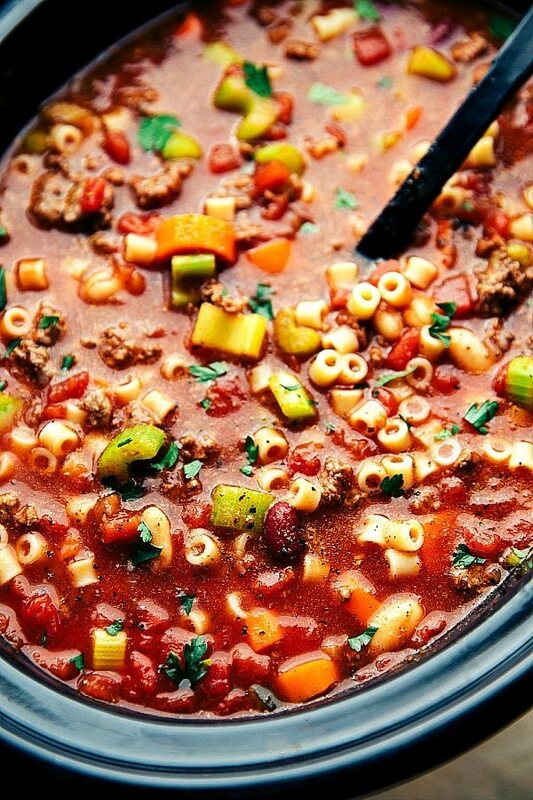 I love pasta e fagioli! Haha!! 🙂 Thanks so much Ashley! Thank you for this recipe! I am trying it out tonight. Unsure how I feel about the red wine vinegar but I trust you . . . Havent tasted it yet so will report back! Thank you for listing your delicious recipes, I’m going to be making several for my parents after my dad has back surgery. Thanks again! This recipe is absolutely amazing. Thank you? The instructions mention adding thyme, but I don’t see it in the ingredient list nor in the instructional video. Should it be added and if so how much? I’m so sorry about that Tonya! Thanks for pointing out the error, I’ve updated the ingredient list to include 1/2 teaspoon dried thyme 🙂 Enjoy! This looks like a great soup. Could you tell me if ‘seasoned salt’ is table salt? Thank you Sharon! 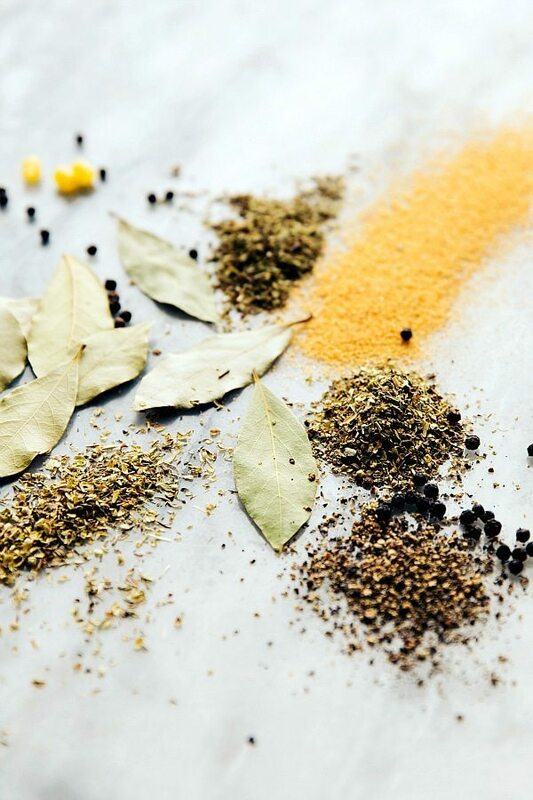 It’s not; seasoned salt is a blend of table salt, herbs, spices, other flavorings. You can use table salt in a pinch, but I definitely prefer seasoned salt. Enjoy! Ok…so the red wine vinegsr goes into the crockpot if one is cooking pasta in the soup…or shake it on precooked pasta b4 serving if cooking separately…? Will be trying this soon ! But I do have a question – no onion? I know there is going to be a little in the spaghetti sauce, but I put onion in almost everything, especially soups. Thanks! Hi Natalie! You can absolutely add in an onion 🙂 That will be delicious in this soup! Made this last night and it was so so delicious!!!! A bit hit with my entire family!!! Thank you!! I plan on cooking this soup and then freezing it before eating it. If I do this, what is your recommendation on how to cook the pasta? Thanks! I would cook the pasta after you’ve thawed the frozen soup 🙂 Enjoy! EXCELLENT! Thanks for sharing I’ll be making this again & again!!! I see I‎t serves 6 people but how big is a serving size? I just threw this in the crock pot and realized I put 1.5 teaspoons of Himalayan salt instead of seasoned salt, which I also have on hand, I’m kind of bummed because Im sure the seasoned salt adds a lot of flavor. Will it be too salty to add some of the seasoned salt as well? I looked forward to this all day while it was cooking, but it honestly just tasted like a tinny-tomato chili with Italian herbs. Not at all like the Olive Garden version and definitely not a proper-tasting pasta e fagioli. So sorry this didn’t meet your expectations! 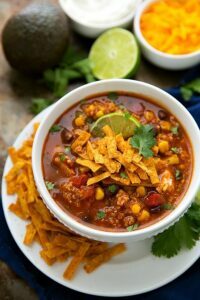 Can you make this on the stove instead of a crockpot? And would you need to add any water? Doesn’t seem like a soup with just spaghetti sauce? Thank you. It gets more soupy/liquidy cooking in the crockpot. I’m not sure what you’d need to add for a stovetop version without personally testing. Wish I could be of more help!